This new seasonal cook book is repleat with dishes that will fill your kitchen with succulent aromas and your tummy with warmth. Once again eight seasonal menus encapsulate all the treasures of the season with scrumptious tidbits of culinary folklore, a sprinkling of food history and a soupcon of foodie stories. 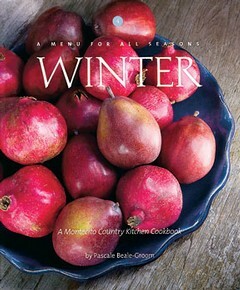 "The stunning photography makes it worthy of a place on your coffee table, but the tried and true menus ensure that Winter will live in your kitchen."